Egypt's new president said on Monday he would not impose new taxes or devalue the country's currency and that his government would rely instead on investment, tourism and exports to fix an economy ravaged by a year and a half of political turmoil. Mohamed Mursi, 61, has a window of opportunity to push through economic change while he still commands political goodwill 50 days into his tenure as Egypt's first freely elected president, economists say. Yet he must tread carefully to avoid angering a population that rose up to oust Hosni Mubarak last year partly because of high inflation and the widespread belief that the fast economic growth in the last years of the former president's rule was not reaching the poor. Among measures that have been proposed by economists are a reduction in the value of the currency, which has fallen by only 5 percent over the last 18 months despite the drop in demand from tourists and investors. But asked if his government had any thought of devaluing the Egyptian pound, Mursi said: "No. Definitely not. This is completely out of the question." Mursi was speaking to Reuters in his first interview with an international news organisation hours before leaving for China, where he hopes to attract investment and improve economic ties. Next month he flies to the US on a similar mission. "I am seeking out the interests of the Egyptian people in the east and the west. I will go wherever these may be," Mursi said, speaking from the ground floor of the presidential palace. "The interests of the Egyptian people require that we balance our relations with the whole world." The anti-Mubarak uprising and its aftermath chased away both tourists and foreign investors, two of Egypt's main sources of foreign exchange, putting pressure on the currency and helping to widen an already swollen budget deficit. Mursi's officials acknowledge the challenge. They say Egypt needs to create 700,000 new jobs a year, a target that will require growth of 6 percent a year or more. That level had been achieved in the last years of Mubarak's rule, but stalled after he was toppled. The government last week formally asked the International Monetary Fund (IMF) for a $4.8 billion loan to plug the financing gap in its budget and balance of payments. In the last three months, Qatar, Saudi Arabia and the Jeddah-based Islamic Development Bank have pledged Egypt more than $5 billion to help it stave off a balance of payments crisis, but the money will not provide a long-term fix for a hard-pressed nation of 82 million people. A weaker pound would encourage exports and stop a drain on foreign reserves, which have fallen by more than half since the uprising, to $14.5 billion. Yet it would make tea, sugar and other imports bought by the poor even more expensive. Wheat, a big import and their main staple, is heavily subsidised. Mursi also ruled out any new taxes, at least in the short term. "There are no new taxes that will be imposed on the Egyptian people during this period," Mursi said. 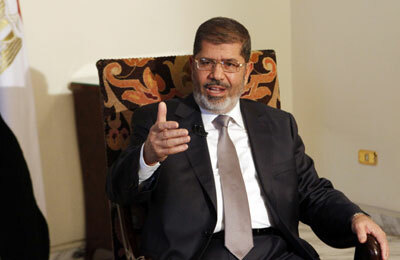 "The tax system needs reviewing so that government support reaches those who need it, not those who don't," Mursi said. "There is a gradual plan so that taxpayers bear their true responsibility and pay what they truly owe." These, he added, would be revisions and not new taxes. "I am not talking about a sudden law that would impose a tax on the people to pay new taxes without study. We want to reduce the burden on the most impoverished. We want to support the poor and needy," he said. The deficit in the new, 2012/13 budget is equivalent to 25 percent of total spending. The government has been relying on local banks for finance, but these banks have run low on funds to lend. This has pushed interest rates on some treasury bills up to almost 16 percent, further widening the deficit. "We are trying by all means possible ... to reduce this deficit, and we envisage that within a few years, within three to five years, this deficit may decrease by a tangible amount. "The situation now is more stable. The amount of reserves now at the central bank is above the limit of fear, above the red line," he said.